Browse information like personnel directories, room or desk availability, wayfinding, and other workplace services on touch-enabled displays. It’s simple to build, deploy and administer. Service cards make it easy to find people, spaces, and more. Customize colors, fonts, and more with card theme controls. Share cards to one or many devices in just a few clicks. Deploy thousands of devices with centralized controls. Appspace makes finding what you need in the workplace fast and easy. Find people, spaces, and much more with HTML Service Card templates. Deploy on large or small touchscreens, landscape or portrait, and run a messaging channel on idle. It’s flexible and easy to administer at scale. Working with a new team or meeting someone you’ve never met before? Appspace’s interactive directory card makes it easy to find and connect with the person (or people) you need. Need to find a meeting point or nearby amenities? 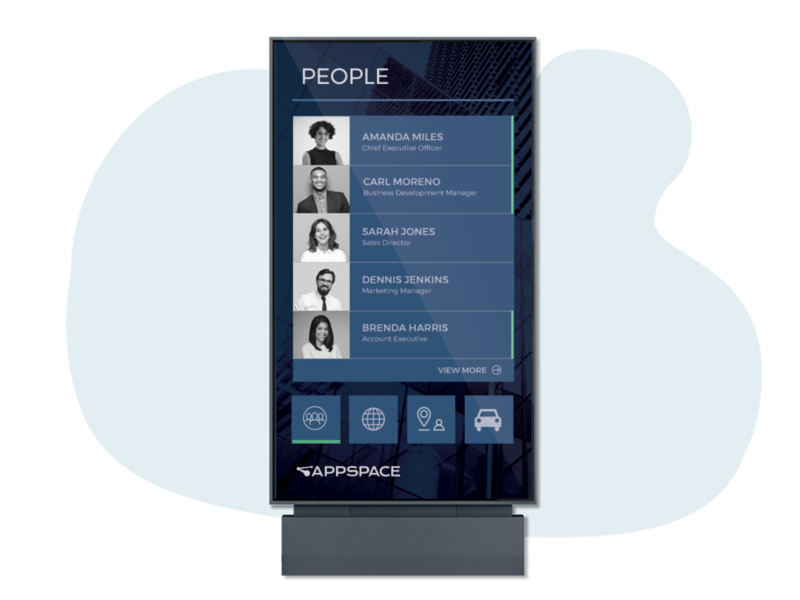 Appspace’s interactive wayfinding card makes it easy to find your way around the workplace. The Appspace Room Scheduling Board makes it fast and easy to see the availability of all meeting rooms and book it instantly. All the features and functions you expect from an enterprise platform. The digital workplace is made up of several solutions. Appspace can help you put the pieces together. The Appspace platform is fast, secure, and grows with you. With flexible configuration settings and powerful administrative tools, deployments are tailored to you.